Construction of the The Royal Hospital for Seamen began in 1694 on the site of the old Tudor Palace of Plancentia. The Palace of Placentia had been the birthplace of Henry VIII, Mary I & Elizabeth I & due to its location on the River Thames it gradually overtook nearby Eltham Palace as the preferred Royal Palace in Greenwich. In 1615 the architect Inigo Jones designed the Queens House for the wife of King James I, Queen Anne of Denmark. Construction of the Queens House stopped when Queen Anne became ill, she died one year later at Hampton Court Palace in 1619. Construction of the Queens House started again in 1929 when King Charles I gave the house to his Queen Consort, Henrietta Maria of France. 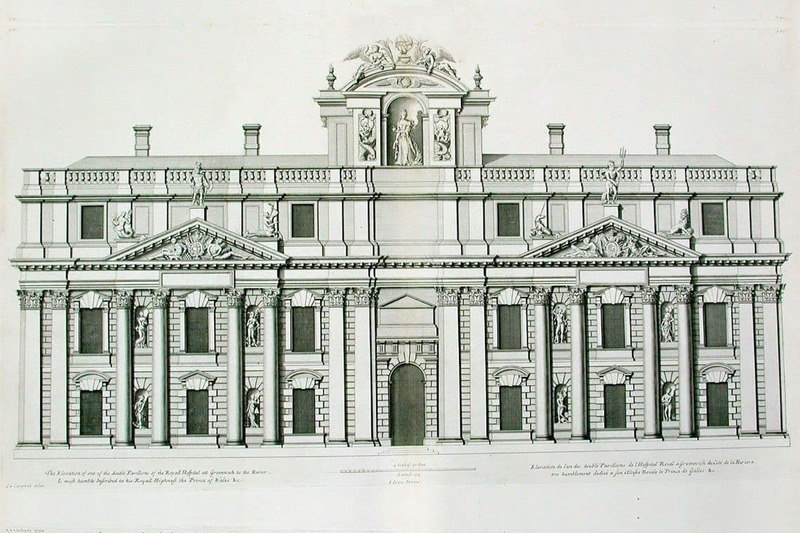 The Queens house was the first consciously Classical building to be constructed in England however it was not completed until 1635, 13 years after the completion of Inigo Jones Banqueting House at Whitehall Palace. The Palace of Placentia remained the principal home of the monarch until the English Civil War, after Oliver Cromwell had taken control of the country the palace became a biscuit factory & later a prisoner of war camp. After the Restoration of the Monarchy in 1660 King Charles II tasked the architect John Webb with demolishing the ruins of the Palace of Placentia & building a grand new palace in Greenwich. Due to financial constraints only one wing was constructed (now the eastern area of King Charles Court). The Glorious Revolution in 1668 saw the replacement of King James II by his daughter & her husband, William of Orange & Mary. The couple were crowned on the 11th April 1989 as King William III & Mary II of England, Ireland & Scotland. In 1692 Queen Mary instructed for a Royal Hospital for Seamen to be constructed at Greenwich. It is said that Mary had been inspired to build a naval counterpart to the Royal Hospital Chelsea after seeing injured sailors returning from the Battle of La Hogue. Sir Christopher Wren was tasked to design the new Naval Hospital & he draw grand designs for a large structure topped by an enormous dome. Mary requested that the view from the Queens House to the River Thames be maintained & Wren altered his designs & started construction of four quadrants. King Charles Court & Queen Anne Court sit closest to the River whereas King William Court & Queen Mary Court sit further back & are topped by two large domes. Queen Mary Court housed the hospitals Chapel & King William Court was home to the sailors dining area, The Painted Hall. King Charles Court, designed by John Webb. The Royal Hospital for Seamen, designed by Sir Christopher Wren. 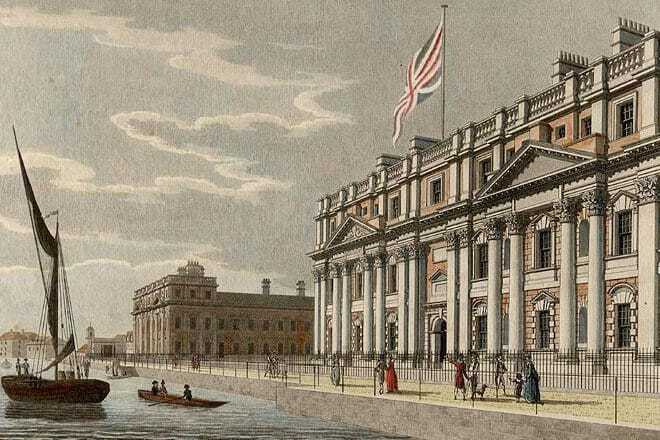 The Royal Hospital for Seamen closed in 1869 & in 1873 the buildings were turned into the Royal Naval College. For 124 years naval officers from around the globe studied at the Royal Naval College. 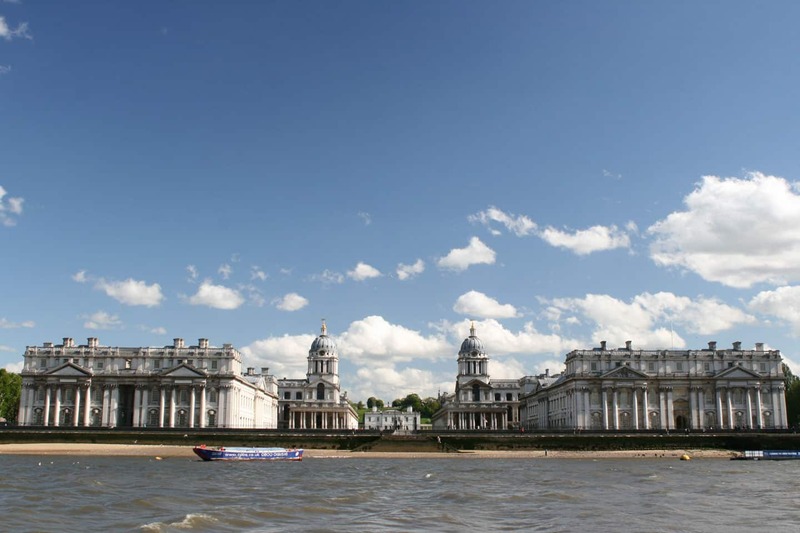 In 1997 the Royal Navy left & the Old Royal Naval College is now home to the University of Greenwich & Trinity Laban Conservotoire of Music & Dance. The Grounds of the Old Royal Naval College are open to the public free of charge. The Chapel is also free to the public & there is a small charge for entry to the Painted Hall. 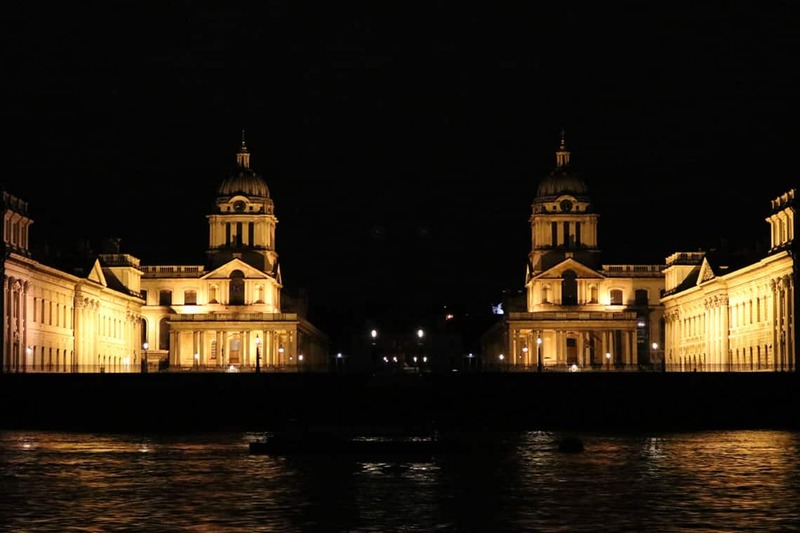 Click the link below to visit the Old Royal Naval College website & learn more about the sites rich history. The young artist James Thornhill was commissioned to decorate the lower hall, the agreed price for the work was £1 per yard for the walls & £3 per yard for the ceiling. After the completion of the lower hall he successfully applied to paint the upper hall & vestibule. After 20 years Thornhill had finished one of the largest painted ceilings in Northern Europe at 40,000 square foot. The masterpiece earned him a fortune & a Knighthood from King George I. Between 2016 – 2019 the Painted Hall underwent an £8.5 Million conservation project. Entry to the hall is now through the King William Undercroft where visitors can find a gift shop, café & a Sackler Gallery interpretation space which helps to tell the story of the Painted Hall. Children (16 & Under) | Free with an accompanying adult.